One of the hardest products to get right for acne is a cleanser. They can be too harsh and dry your skin out more (especially if your skin is dry or sensitive along with acne). Or they don’t cleanse enough and therefore prove fairly useless. But all hope is not lost! This is exactly where Micellar water for acne comes in. Switching to this as your cleanser can make a significant difference, especially if you use it following the important tips on this page. Getting your skin properly clean is super important always, and even more so if you deal with breakouts, pimples, blackheads and acne. It’s likely you wear a bit more makeup to cover up blemishes and even out your skin (men perhaps not, although there’s no reason why you can’t wear some concealer!). Ensuring this is thoroughly cleansed off helps to prevent more clogged pores. 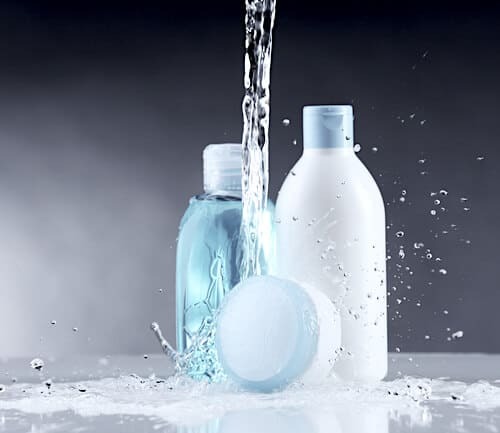 Proper cleansing also ensures the following products and treatments you apply work better, as they aren’t competing with a layer of grime still left on your skin. Those endless breakouts can be caused or at least increased by improper cleansing. So getting this step right goes a long way in getting clear skin. Micellar water has “micelle molecules” suspended in it. These little things lift away grime, makeup (even eye makeup and lipstick!) and dirt, without the need for wetting your skin or rinsing it off. It’s a very simple product, and another great thing is that it is fairly cheap! 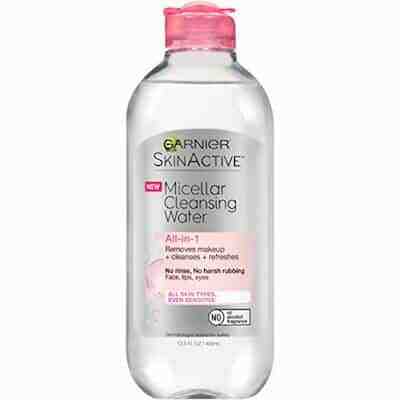 Garnier’s Micellar Water in particular is a good one for a great price (product recommendations at the end of this article). There really is no need for an expensive cleanser anymore if you use this properly and it works for you. This is the only cleansing product I use now. It is awesome. One huge benefit of Micellar water is you use it on dry skin and don’t rinse it off. So you do not need to use any (normal) water on your skin at all. This might not seem significant – but it is. Especially if you have “hard water” or enjoy particularly hot showers (like me! ), the avoidance of any water on your face can really help your skin. Do you ever notice your skin is more red after washing it, or red spots and breakouts are more obvious? Water can be harsh and really disrupt your skin, especially if it is sensitive. Get yourself a big bag of cotton balls or pads. You will be using a few each time. These are also a great way to see how clean your skin really is – ever used a toner after cleansing and been surprised at how much dirt still comes off on the cotton pad?! By the way, I prefer cotton balls to pads, because they hold liquid better and seem to allow more to actually be applied to skin. They’re also softer. That’s my preference, but it’s entirely up to you! Once you have finished this first once over, soak another cotton and go over your skin again. Depending on makeup, grime, or just how you feel, you may end up doing this 3 or 4 times. That’s ok! You won’t be using much, and it is totally fine for your skin. Keep doing it until the cotton ball comes off clean. Once you feel clean enough, you just need to wait a minute or so for it dry. Then carry on with the rest of your routine. You can apply your normal moisturizer now. Or this is a good time to apply an acne treatment or exfoliation product if you choose. After the first time using Micellar water like this, you might instantly notice how much less irritated and dry your skin feels. That’s a really good thing. Keep using it, and after a week or two you might notice less breakouts as it continues to be gentle and really cleanses your skin. Micellar water is great at cleansing, but it doesn’t have much “activity”. So if you deal with breakouts or acne, and especially blackheads, you likely still want to use a more active treatment at least a few times a week. A product with glycolic acid or salicylic acid is a great choice. These dissolve oil and dead skin cells, helping to unblock pores, rebalance skin, and prevent breakouts. This is the product I use, and totally recommend. It’s a good price and does exactly what it should. While you find more expensive brands, they essentially do that same thing (and the more expensive brands are usually just marketed that way, or have added ingredients that you don’t really want). With Garnier, you get a good Micellar water. Simple. La Roche Posay is a bit more expensive, but it is quality brand and you can’t go wrong with French brands! It is marketed “for sensitive skin”. Micellar water itself is good for sensitive skin, however if you are concerned this may be a good choice.